Guide to Training Muay Thai in Chiang Mai - Milk.Blitz.Street.Bomb. If you’re thinking of training in Thailand but you want to avoid the bustling cities and mega tourist traps, then Chiang Mai might be the perfect place for you. With it’s stunning mountains and peaceful pace, it has everything you need to unwind…Plus it has some amazing Muay Thai camps to train in. Chiang Mai is situated in a mountainous region in the centre of Northern Thailand, far from the bright lights and bustling streets of Bangkok… 400 miles away to be precise. This makes for some amazing scenery and a slightly cooler climate, but it takes a while to reach. If you’re travelling in from the West you’ll need to fly into Bangkok, and then catch a connecting flight into Chiang Mai, which takes about an hour. To save some money you could alternatively jump on a sleeper train or bus, but this will take you around 12 hours and is not as luxurious or safe. Once you’re in Chiang Mai, you’re spoilt for choice in terms of places to visit, things to see, and camps to train at. The Old City is surrounded by a 700 year old fortress wall and moat, with tons of amazing ancient temples, markets, street food stalls and spas. If you’re staying here, the Tha Pae Gate on the east side of the city is a great location with easy access to the highway for travelling around. If you prefer a more peaceful stay, Chiang Mai’s riverside is situated just outside of the city and offers a much slower pace of life, but still has enough restaurants, bars and cafes to keep you busy – many of which are overlooking the river Ping. You’ll pay a little bit more to stay in Riverside, but it shouldn’t break the bank – even on a modest budget. Wherever you stay, you won’t be far from mountain treks, temples, elephant sanctuaries, and even some vibrant night life to indulge in when you’re not training. Chiang Mai boasts a great selection of gyms with experienced coaches, superb facilities, and great accommodation and food options. If you want to train in pure luxury, Gym Bangarang is the place to be. With incredible private villas, an outdoor swimming pool and delicious meals served around the clock, you will struggle to find a nicer place to train. The gym itself is modern and well equipped with plenty of heavy bags, free weights, mountain bikes and a professional boxing ring. Overlooking the mountains, the surroundings are beautiful and the standard of training is high with a number of ex-pro fighters leading sessions. For city centre training, you can’t beat Por Silaphaigym gym in the heart of Chiang Mai. It has a decent sized outdoor (but covered) gym and basic accommodation if you want to stay there. There’s also a café next door which offers some very reasonably priced food – and if you want to stay elsewhere, there are plenty of hotels nearby. Set just outside of the city with an amazing jungle backdrop, you’ll find Team Quest. It’s actually a mixed martial arts facility founded by UFC hall-of-famers Rand Couture and Dan Henderson, but has a heavy focus on Muay Thai. Team Quest isn’t the most lavish gym in Chiang Mai, but if you’re serious about you training, you’ll be worked incredibly hard and learn a lot. This is a typical Muay Thai training routine at Team Quest, but routines will obviously vary from gym to gym. During evenings and on non training days, there’s plenty to keep you busy in Chiang Mai from country treks to ancient temples and markets. Sitting on 2.5km above sea level on the highest peak in Thailand, Doi Inthanon boasts some incredibly beautiful gardens and over 300 species of animals. It’s a great place to take in breath-taking sites and catch a glimpse of some rare animals. 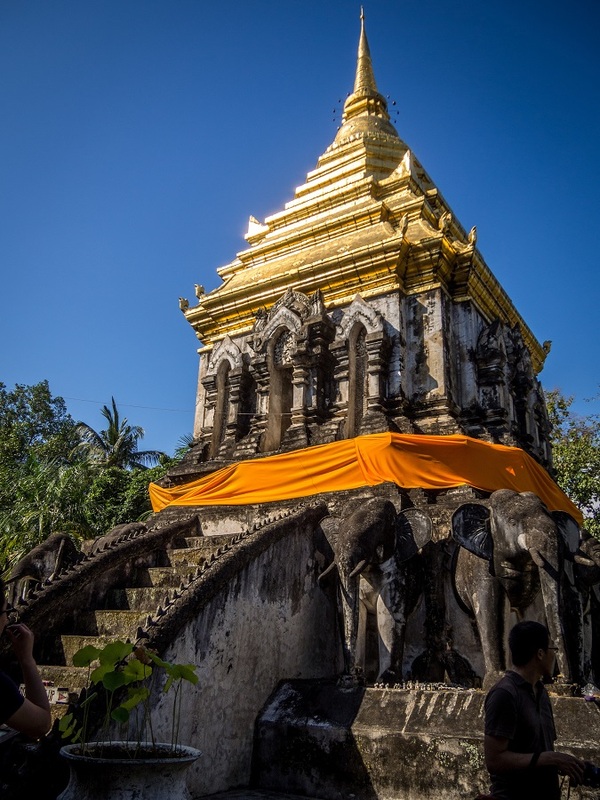 The oldest temple in Chiang Mai, believed to have been built in 1296 – it’s definitely worth a visit. It has some amazing gardens and incredibly detailed stone carved elephants. A mixture of stunning natural beauty, culture and tranquillity, along with some quality Muay Thai gyms, make Chiang Mai well worth a visit. If you’re thinking of training Muay Thai in Thailand and want to stray from the crowd to take in a slightly different experience, it’s well worth the journey. Darren Mitchell is a writer for the BestMuayThai blog, an advice centre for Muay Thai enthusiasts of all levels. Darren has trained Muay Thai all over the world and has been lucky enough to train with some excellent fighters and coaches. Your support helps us to continue our work by contributing to the operational costs of Milk.Blitz.Street.Bomb.